Here we are… already nearing the HOLIDAYS! And honestly, I’m not ready! With every golden leaf that I see spiraling to the ground I take a deep sigh..seriously. Why do I do this when this is my favorite time of year? Well I think it’s because I feel like time is getting away from me. I have/had BIG hopes that I can/could decorate this Dirty Diamond with all of the fall decor that I have in storage and now Christmas is on my doorstep–thanks Hobby Lobby, Wal-Mart, Lowes, etc. for the constant reminder and I’m like dragging my feet, protesting TIME. Don’t get me wrong, we have done a TON to this fixer upper. So many of the little improvements I have not posted because some of them are not completely finished and I kind of wanted to post blog posts with the finished product for your viewing pleasure. So, I have decided to post a few blogs with some of those “Small Improvements” (hence the title of this post) so you can see all the little things we have been working on even if they are not completely finished. And then…hopefully…in the near future I can give updates of the FINISHED product/project. So here we go. 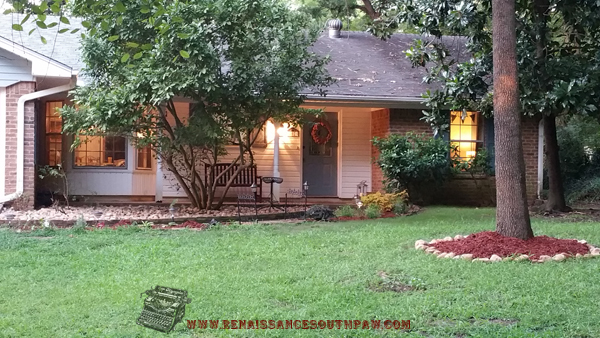 Today I would like to share with you some of the small improvements to the front yard. If you have been following my blog you probably remember the Dirty Diamond meets River Rock. I’m still in LOVE with this look!! No second thoughts. No wondering if something would have looked better. It is beautiful and low maintenance . The only thing that I would say might be a challenge at times is the leaves that fall from the Tulip tree onto the rock. But that is what leaf blowers are for. 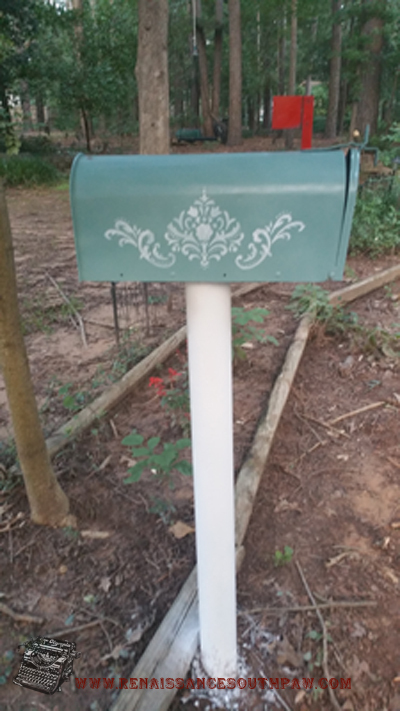 :>) Another improvement is the mailbox. 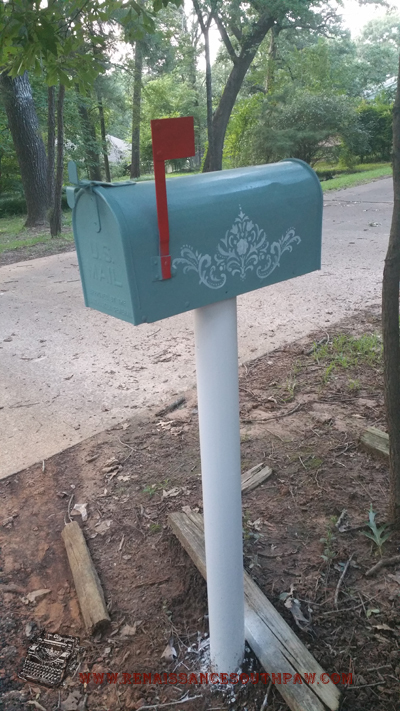 Seems like such a small detail but when you have an ugly mailbox this is the first thing that greets most people. And ours was U.G.L.Y. I have a common color that I’m trying to keep tied in with the entire house. My front door is painted a similar color, lawn chairs, outdoor pillows, our wooden swing, etc. 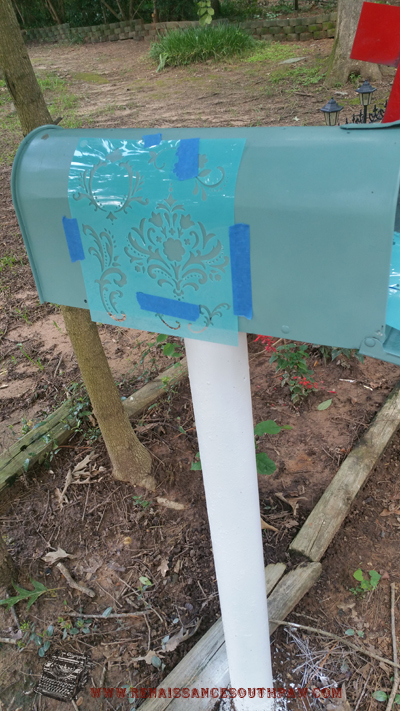 This color is called, “Secluded Garden” spray paint by Valspar. 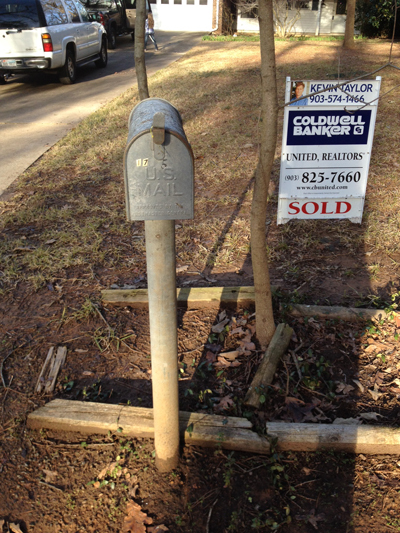 I could have bought a new mailbox, but it is pretty sturdy and well placed. Plus, trying to stay within a budget. I bought this Martha Stewart stencil from Joann Fabrics. 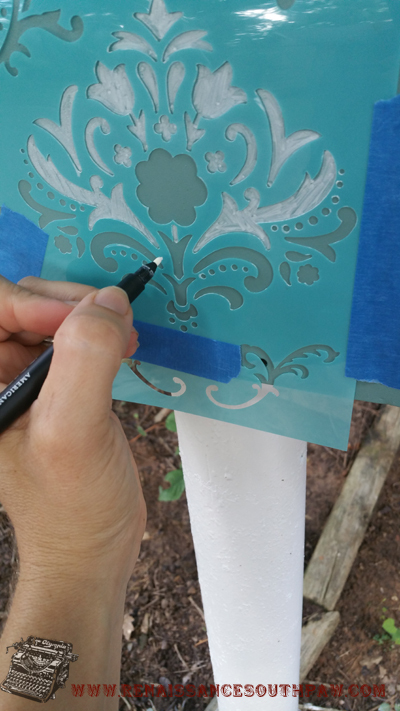 Using Chalk Markers to help me stay within the stencil. 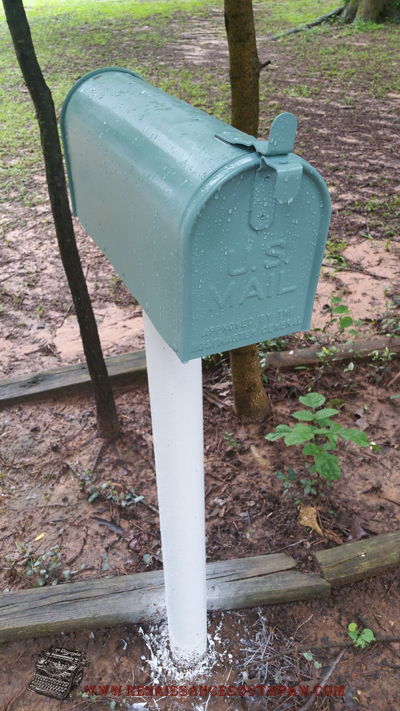 I sprayed Rust-oleum protective gloss enamel to coat the mailbox as a sealant. Another little improvement was building a small flower bed around a tree in our front yard. It wasn’t necessary but I was curious how it would look. I re-purposed the extra roofing shingles as a weed barrier (SERIOUSLY A MUST). 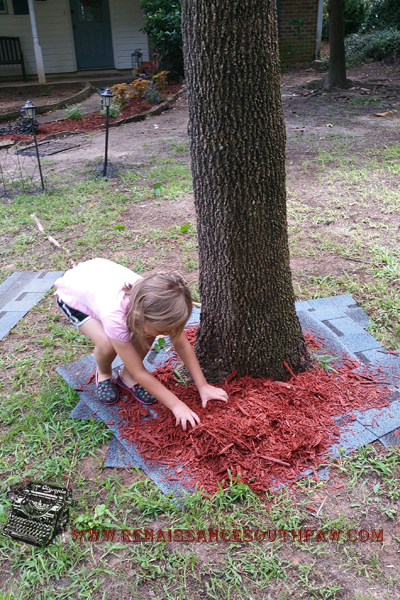 I had one of my little helpers then help me spread out mulch to cover the area. We then used some of the extra river rock to create another small barrier to keep it contained. We planted a few plants. I think it really adds to some of the curb appeal I’m trying to achieve. 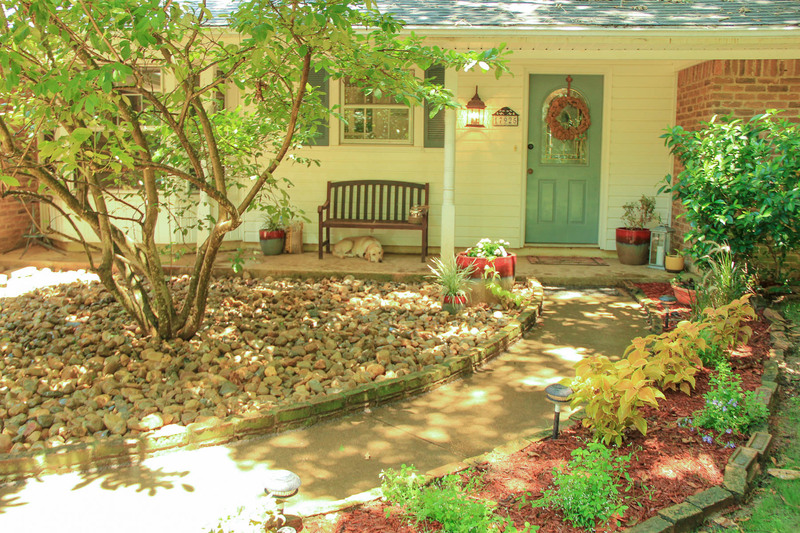 This picture doesn’t have the little plants in place around the tree flower bed. I’ll need to update this pic soon. So that is all for today. I will post blogs in the coming days of more small improvements. Thanks for reading! < Previous We’ve Got Spirit! How ‘Bout YOU?!? !